If you haven’t yet heard of Eva Mozes Kor, here’s your chance to learn about this incredible woman. 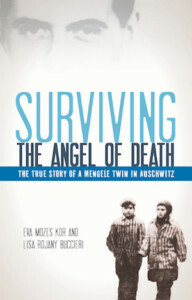 The Floyd County Library is hosting a series of programs around her book, Surviving the Angel of Death: The Story of a Mengele Twin in Auschwitz, and a new documentary about her life journey. Overdrive/Libby – Borrow the ebook or place a hold. Hoopla – Download the ebook on any device that uses apps with no waiting! You can also get a free copy of the book from one of our customer service desks if you sign up for a book discussion! Eva’s book tells the story of her childhood in Romania, where her family was the only Jewish family in their small village. When Eva and her twin sister Miriam were 10 years old, her family was put on a train to the Nazi death camp Auschwitz. On the train platform, a Nazi guard noticed the two girls and asked their mother if they were twins. When their mother said yes, Eva and Miriam were separated from her and taken to join other young twin girls. These twins were all forced to undergo medical experiments at the order of sadistic Nazi doctor Josef Mengele. Eva made a promise to herself that she and Miriam were going to get out of Auschwitz alive, and her determination to keep that promise was tested to its very limits. In plain language that does not downplay the horrors she went through, Eva details the events of her childhood before and during the Holocaust. Her story, written for young adults, is a quick read that is difficult to put down. Eva’s will to survive and her ultimate belief that love and forgiveness can change the world, despite all that she witnessed, is challenging and inspirational. This book is highly recommended for anyone who has an interest in true stories of extraordinary people, Holocaust memoirs, or the story behind Eva’s activism in her adult years. Here are the related events happening soon at your library! Pick up a free copy of the book at any customer service desk when you register for a book discussion! Tuesday, Feb. 26th, 12 PM – 1 PM (Adult discussion). Led by Melissa Merida and Sandra Fortner. Thursday, Feb. 28th, 5 PM – 6 PM (Teen discussion).